FAO organized an international training course to train national Master Trainers in locust-affected countries. The course was held near Muscat, Sultanate of Oman on 7-17 October 2002. The course was sponsored by EMPRES/CR and the FAO regional Desert Locust commissions (CRC, SW Asia, and CLCPRO). The purpose of the course was to strengthen the capacity of locust-affected countries to provide training to their own staff. The 11-day programme consisted of technical training in locust survey and control, and training skills on how to effectively teach other people. Similar to other locust courses organized by FAO, practical hands-on exercises in the classroom and in the field, supplemented by discussions and demonstrations, were completed by the trainees in groups of four persons each. Pre- and post-course assessments were made to measure trainee progress. 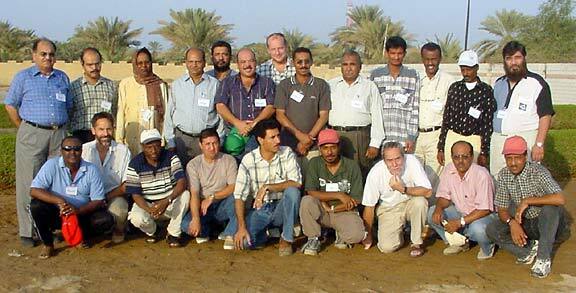 Sixteen participants from 13 countries (Djibouti, Egypt, Eritrea, Ethiopia, India, Iran, Libya, Oman, Pakistan, Saudi Arabia, Somalia, Sudan, Yemen) were trained by five trainers in Desert Locust survey and control as well as in training skills. The trainers were from FAO (Keith Cressman, Munir Butrous, Fuad Bahakim), NRI (Hans Dobson) and Wolverhamptom University (John Lowe). A co-trainer (Felege Elias) from Ethiopia provided additional assistance. The course was also an opportunity to field test a draft FAO Desert Locust Master Trainer Manual that is under preparation. The 500+ page manual consists of training modules (lesson plans) on survey, control and training skills that can be used by Master Trainers to train locust staff in their own country on survey and control as well as other national trainers. The manual will be finalized in early 2003.